Welcome to Wild Atlantic Campers, the motor-home hire (campervan) specialists located near Oranmore, Co. Galway, on the Wild Atlantic Way. Wild Atlantic Campers is based midway along the Wild Atlantic Way near Galway city. We specialise in the hire of motorhomes/campers and we hope to exceed your expectations in terms of customer service, comfort and reliability. We have the 7 berth (6 adults plus 1 child) Rimor Katamarano (2016 model) which offers our customers comfort, style and space, 2017 Rimor Katamarano 95P Plus (large 5 berth), 2017 Rimor Katamarano 12P Plus (medium size 4 berth), 2019 Rimor Seal 12P Plus (medium size 4 berth) and the VW California (2018 2-4 berth campervan) We have other size motorhomes available on request.Feel free to send us your requirements, and we will do our best to facilitate your needs. 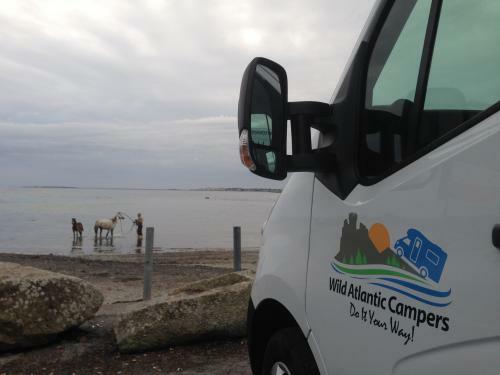 Why hire from Wild Atlantic Campers? no accommodation at your destination, be in the race track or the horse show, bring your own on wheels! enjoy…. Where will your adventure take you? competitive for our well equipped vehicles and an ability to hold up to 7 people. That is from €15 per person per day to cover transport and accommodation costs. What our high quality luxurious vehicles will have as standard? Go northwards via Galway city and enjoy the breathtaking scenery that Connemara offers and onwards towards Westport, Achill Island or continue towards Sligo and Donegal. Go southwards to the Burren (Clare), Cliffs of Moher or take the ferry across the Shannon Estuary to Kerry and check out the Dingle Peninsula or the Ring of Kerry or onwards to West Cork. The choice is yours!